Identifying cryptic or elusive species in their natural habitat is vital for conservation planning and habitat management. However, finding species that are small, well-camouflaged, or live in hard-to-reach places is challenging. Traditional survey methods are both time and labor intensive, and may still yield inadequate findings. Environmental DNA (eDNA) is a novel approach for wildlife population monitoring. It works by identifying and quantifying traces of genetic material that an animal has left behind in the environment. We are applying this tool to detect the four-toed salamander (Hemidactylium scutatum), a cryptic amphibian species of concern in New York. We are developing a new quantitative PCR (qPCR) test specific to the four-toed salamander. 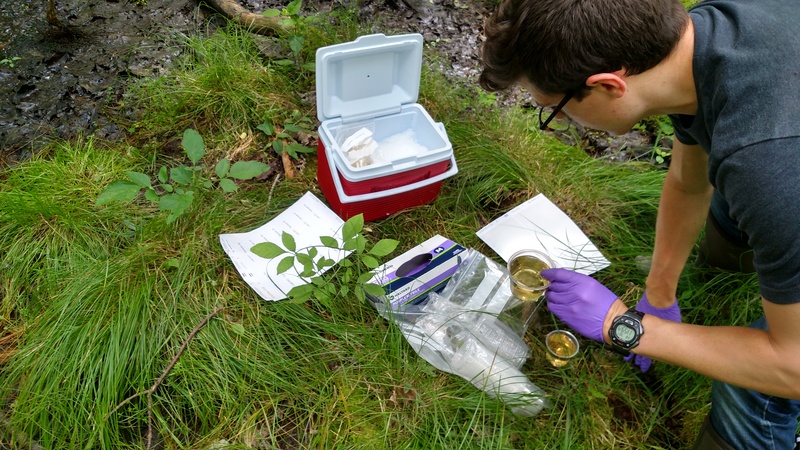 This will allow us to identify DNA from four-toed salamanders in filtered water samples from candidate breeding ponds more quickly and accurately than with traditional survey methods. We are validating this eDNA method by comparing the results with traditional survey methods at test ponds in New York. We collected water samples from May through July 2017 from ten pools with historic or contemporary reports of four-toed salamander presence. Once validated, we will be able to improve the distribution map for this species by testing water samples collected from locations across the state.